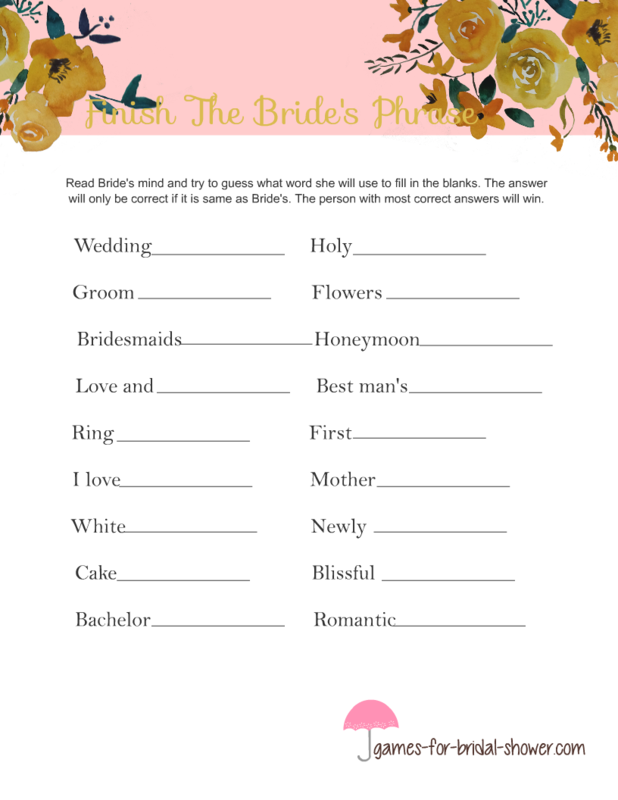 This is a free and fun printable game for Bridal Shower in which guests will have to read bride-to-be's mind. This game is made very beautiful with beautiful graphics. I have made this game in three colors so you can print the color that you like most or that matches the theme of your party. How to Play: The bride-to-be will also have to participate in this game. 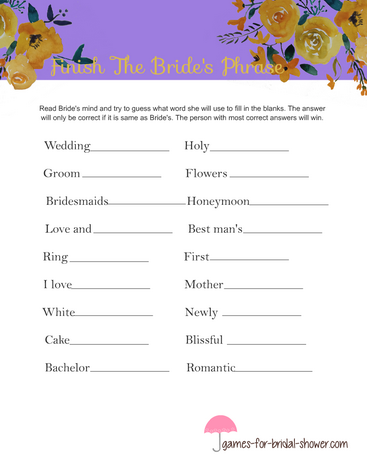 Print and distribute game cards among your party guests along with pens or pencils and also give one card to the bride. 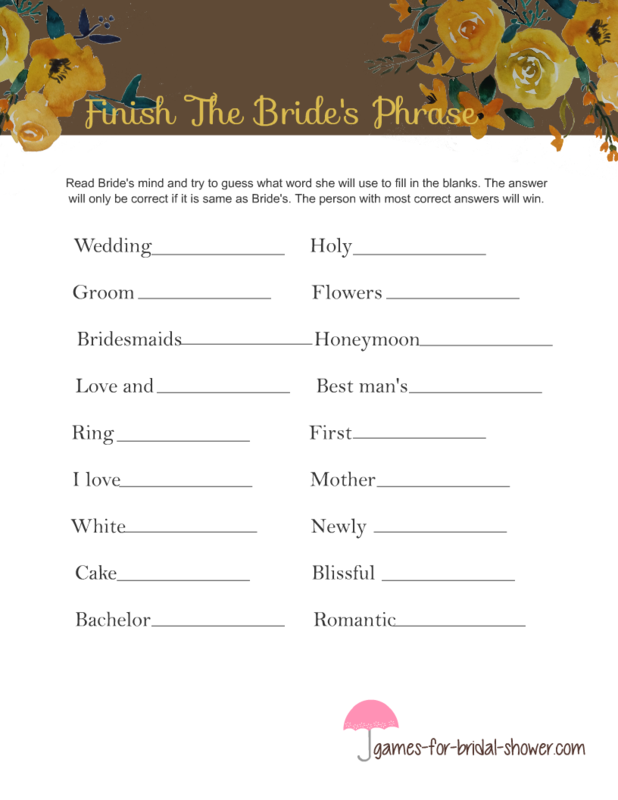 The guests will have to guess which words the bride-to-be will be using to fill in the blanks. 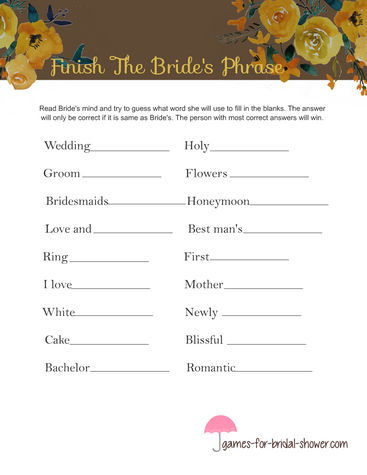 The guest whose answers are closest to those of the bride-to-be will be the winner. This is a free printable image for this game in brown color, decorated with beautiful hearts. You can print this game both on ordinary paper or card stock paper as per your liking and budget. This image can be printed easily using a home printer. In order to save this image, click on the image shared above and then right click and save the bigger image. This is another printable for this game in lilac color. You can also print this game using a black and white printer but colors will be more fun. You can save this image just the same way that I have mentioned with brown printable. Pink is my most favorite color for bridal shower games but you can print games in any color that you may like. This adorable game is decorated with beautiful hearts. Your guests will not only enjoy playing the game but they will also admire the graphics.